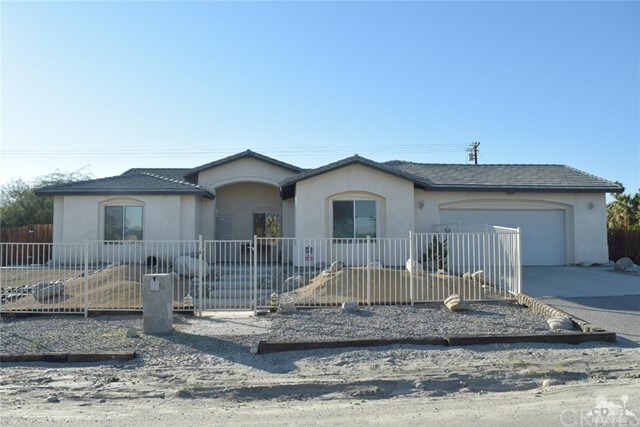 All Thousand Palms homes currently listed for sale in Thousand Palms as of 04/25/2019 are shown below. You can change the search criteria at any time by pressing the 'Change Search' button below. If you have any questions or you would like more information about any Thousand Palms homes for sale or other Thousand Palms real estate, please contact us and one of our knowledgeable Thousand Palms REALTORS® would be pleased to assist you. "This custom desert residence sits on 5 acres of land. Main house has approx. 4800 square feet of living space, in addition a 1500 square foot Penthouse room above the residence, with 360 degree view through plate glass windows, and a 500 Square Foot Patio also. The residence offers a 2 room office suite, for a total of 7500 Square feet. 33 car garage (not a typo), 18 car showroom garage, Dual RV garage, which can stow a helicopter. And yes it has a helipad. (Show proof of Aviation Ins. and copy "
"Spectacular Estate Resting On 1.5 Acre Private Lot In Thousand Palms. With 5 Bedrooms & 5 Bathrooms, this custom estate was designed & built by builder for their family. Quality exudes throughout. Enter electric gates to circular driveway with Spanish water fountain. Home features a formal living room with views to the pool at entrance. Spacious kitchen with custom cabinetry & subzero refrigerator & commercial grade stove opens to cozy family room with fireplace. 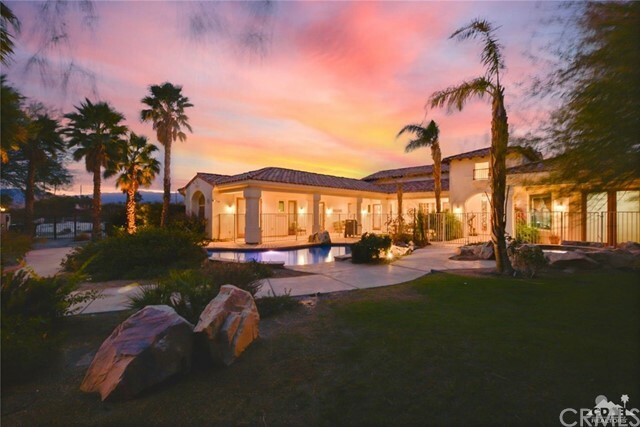 Home features a theater room so "
"Spectacular and private Thousand Palms hacienda-style, custom Ricklyn Ranch Construction built single-story home is ideally situated on approximately 1.27 acres with horse zone property on 1.5 acres. This entertainers dream home features a unique pool with two waterfalls and ample seating for relaxation and fun. 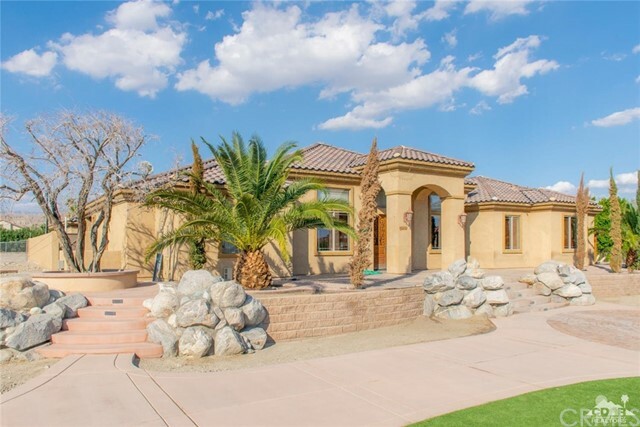 This approximately 2,600-SF home has 4 beds, 2.5 baths, chef's kitchen with top-of-the-line appliances and custom cabinetry, walk-in pantry, breakfast nook and formal dining room, living"
"Private gated horse zoned estate on 1.10 acres in Thousand Palms! Four bedrooms, four baths including attached guest casita plus a home office. Featuring great room with open floor plan. Formal dining area, fireplace with wet bar and patio access. 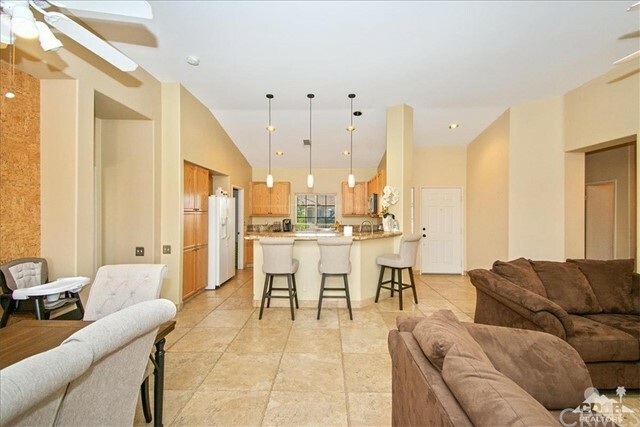 Absolutely charming gourmet kitchen with beautiful wood cabinets and extended granite island and counter bar,upgraded appliances and travertine flooring through traffic areas. Elegant master suite with inviting bath and custom closet. Four car tandem g"
"Electronic Gated home with huge lawn & circular driveway in quiet neighborhood of ranch homes. Oversized rooms with greatroom kitchen, dining & family area with flpc. Separate formal living, has full granite counter wet bar & mirrored shelves. & dining rm. 5 lge bedr's include detached Casita with its own front & back doors. Master suite with walk in closet, huge master bath. dual sinks with jet spa tub. Pool & spa. N/S lighted Tennis Ct. RV Garage & 3 car att. gar. & open rv pking. Dog runs, fe"
"A unique Thousand Palms property perfect for RV owners, contractors, landscapers or other home-based business owners, horse lovers, people wanting room for toys or people wanting privacy. The highly upgraded, CUSTOM, 4 bedroom, 3 bathroom home sits on over one acre of fenced and gated land. 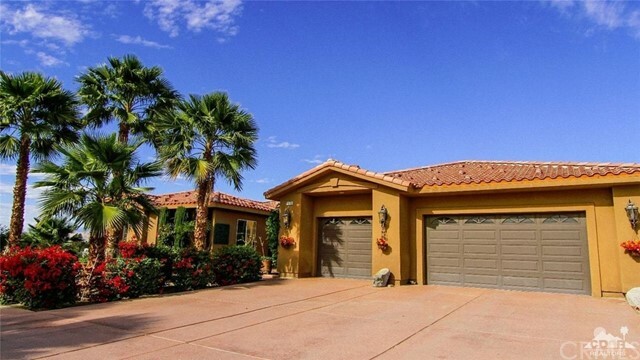 In the front of the home is a beautiful desert oasis with palm trees, a fenced pool/spa and covered patios. Inside the front door is the majestic Great Room, with stone fireplace at one end and a gorgeous gou"
"Stunning Home!! Located in a great family neighborhood surrounded by high end Homes & Estates. Custom Built by owner, who was involved in every detail making the construction an outstanding and absolutely top quality. 4-Bedroom, 2 identical large master suites, plus Two more spacious bedrooms. 4- Baths. Gourmet kitchen, stainless steel appliances, granite counter tops, extensive cabinets and a 2 pantries. Beautiful tile throughout! Home has room for RV on both sides, enough space for toy hauler "
"Elegant, open and spacious, custom built 5 BR / 3 BA is a beautiful retreat that is both contemporary and traditional. Set on a large, gated lot with a sparkling swimming pool, spa, and plenty of outdoor space to entertain and relax; this a home that suits all your friends and family! The entry and living room has cathedral ceilings, plantation shutters, a fireplace and lots of natural light! 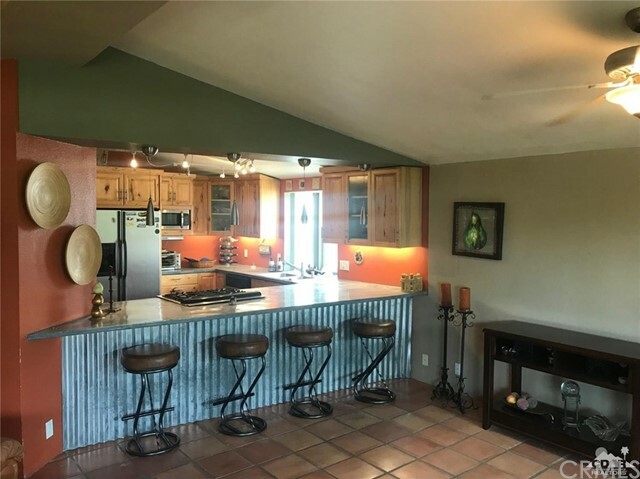 A formal dining area connects the living room to a gourmet kitchen with granite counters; stainless stee"
"Amazing property in Thousand Palms. 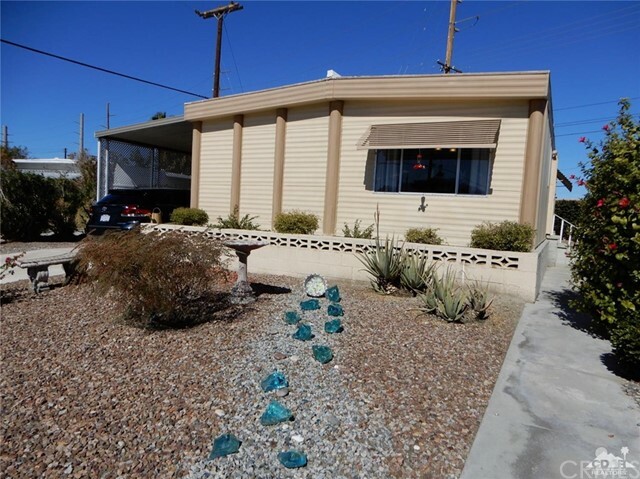 Great location, easy access to the I-10, close to Restaurants, Shopping, School and Casino. Home features a nice patio plus an attached office for your convenience. Great curb appeal." 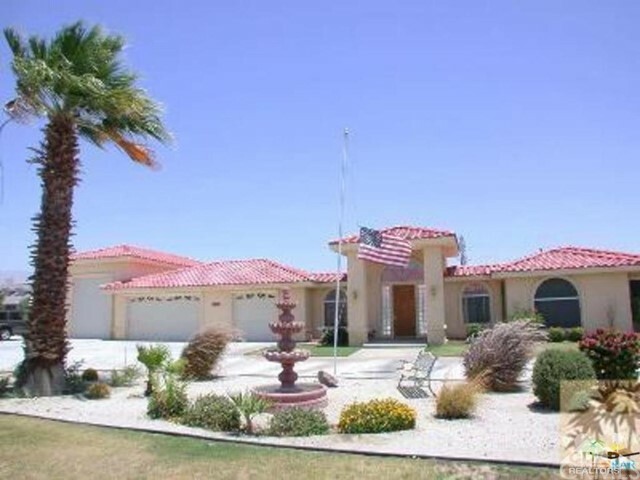 "Beautiful upgraded family home, located in the well desired community of Talavera, in Thousand Palms. No HOA dues. No Mello-Roos! This home features a custom walled courtyard, backyard with pool /spa, and plantation shutters throughout. Great room offers a cozy fireplace. Tile flooring in main living areas and carpet /wood like laminate flooring in bedrooms. Master bath, featuring his and her sinks, large shower and walk in closet! 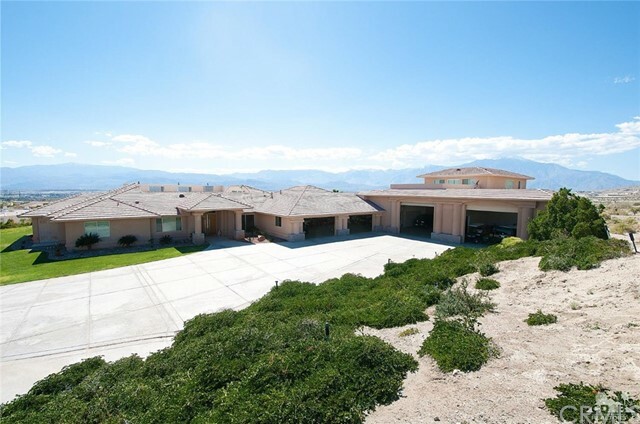 Thousand Palms is a fabulous central location of the Desert!! Ju"
"55+. A magnificent, romantic, custom-built, detached, single-family residential home in the new section of Tri Palm Estates and Country Club. Open plan with huge granite counter looking out to family room. There are so many upgrades in this first class home! A tranquil sun room to relax with a magazine. The back yard has a beautiful view of the 4th fairway furnished with high quality furniture and fire pit. Abundant storage. The third bedroom is currently used as an office/den with two decadent "
"A Rare Opportunity, Beautiful Home on the Golf Course, 12th tee. the View is Stunning, Best View (South Facing) Stunning tile thru out. No Carpet to trip on. The third bedroom has been made converted into a den, Beautiful Appliances, The Best Value, Best Floor Plan in Tri Palms Estates. Skylight in the Hall, Built in Cabinets in the Garage. Furnished, Slider in the master, Barbecue, Fruit Trees, second bedroom on the other side of the house with its own bath/shower with a tub. 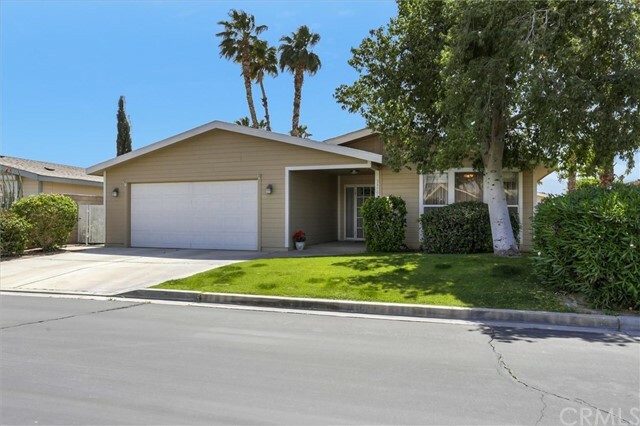 Golf cart is inclu"
"Beautifully remodeled home located in a well desired Thousand Palms neighborhood. Property features many many upgrades! 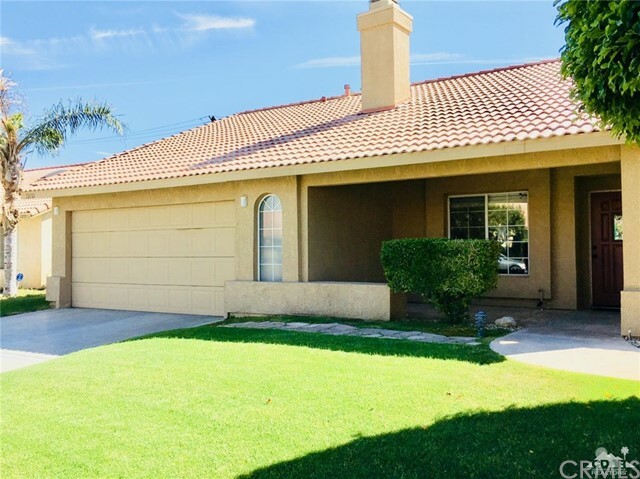 tile floors and carpet in bedrooms, granite countertops in kitchen and bathrooms, custom cabinetry in closets,a finished garage with custom cabinets, RV gate, and a nice covered patio in the spacious backyard. Truly a must see!" 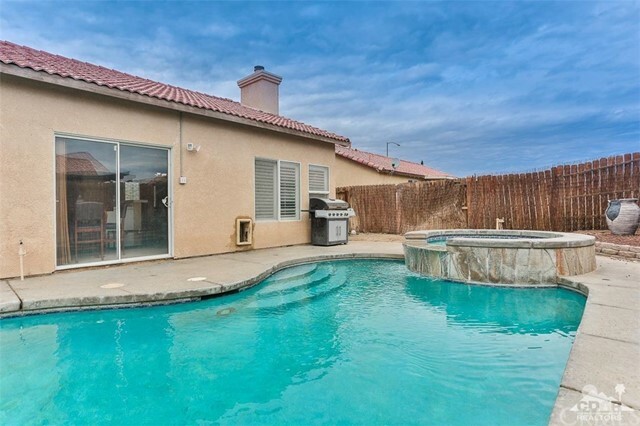 "Unique home in Thousand Palms with no HOA. With 2,059 square feet, this home features four bedrooms, 3.5 Baths (4th bedroom converted into an office). There is a two car garage in the rear of the property, with a long driveway, which is great for storage or extra vehicles. There is a large covered patio area with BBQ and faucet. The lush front yard gives the home great cub appeal." "NICE..........NICE...........NICE........NICE !!!!!!!!!!!!!!!!! Beautiful, Clean and Upgraded you do not want to miss. 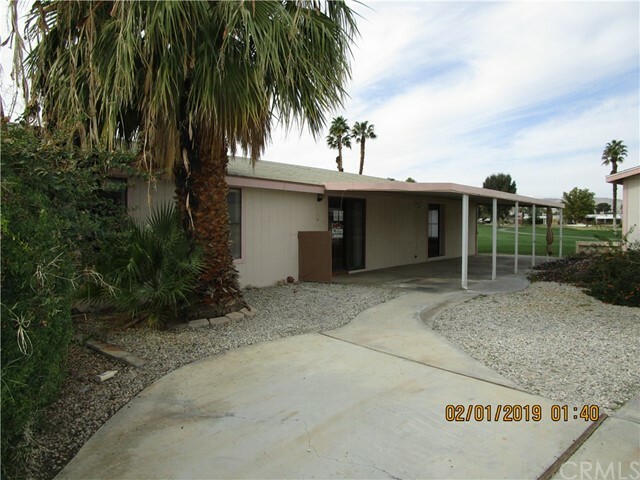 Located in Thousand Palms this great 3 Bedrooms 2 Bathrooms features: Tile floors, custom paint, crown molding, granite counters in kitchen and bathrooms, upgraded garage door, RV Access possible and much more. CLEAN AS A WHISTLE.......... Not to be missed!!!!!!! Make you Offer today............................................"
"Located in Beautiful Ivey Ranch a quiet well maintained 55+ community surrounded by mountains, with a 9-hole golf course, driving range, 4 pools, 2 spas, tennis courts, exercise room with a club house. Off the I-10 and Cook St exit, convenient to all locations. This 1568 sq ft home is a lovely2/2 with a bonus room, for added privacy the 2 bedrooms are at opposite ends of the house. The side yard is very private with a double patio, shrubs flowers, grass and completely fenced. The front yard has "
"Your sitting right on the golf course watching the golfers play, enjoying the shade of your patio sipping on a cool ice tea! Or get out there & join them with free golfing for 2 owners! This community has all kinds of things to do, pools, tennis courts, clubhouse with a restaurant! Plus over the bridge is the major shopping, and restaurants. The floorplan here is well laid out, 2 bed 2 bath with a formal living room/dining area & separate family room that opens up to a large kitchen. The big bon"
"What a deal!! Located in the lowest HOA fee tract in the park. Turnkey furnished with golf cart!! This updated home has been well maintained and tastefully decorated through out. Great home for entertaining family and friends on the large private covered patio with a view of the mountains. Enjoy California Living at it's best. Tri-Palms Estates is a 55+ community that offers unlimited golf for 2 owners, clubhouse, restaurant, bar, pools, tennis, and much more."